An overwhelming majority of eye cancer patients would, according to a new UCLA study published in the June edition of the Journal of Genetic Counseling. "Our goal was to explore what people with cancer want," said Dr. Tara McCannel, director of the Ophthalmic Oncology Center at UCLA's Stein Eye Institute and a researcher at UCLA's Jonsson Comprehensive Cancer Center. "We learned that patients want to know their prognosis, good or bad, even when there are no treatments at present for their condition." The UCLA study surveyed 99 patients who had been diagnosed with ocular melanoma, which develops in the pigmented layers under the retina. Half the patients had undergone localized radiation to shrink the tumor. The rest of the group also underwent radiation but first had cells from their tumors biopsied. These cells were grown in culture and studied for a missing copy of chromosome 3 — the genetic marker most strongly linked to rapid metastatic disease. Patients whose tumors contain the genetic marker have at least a 50 percent chance of death within five years, due to swift spreading of the tumor to the liver and other organs. Aggressive cases can result in blindness and death in as little as a year. In the UCLA study, all the patients were asked to evaluate their interest in receiving genetic testing results related to prognosis. Of the 99 patients, 98 responded that they would have wanted predictive testing at the time of their treatment; only one would have declined. Additionally, 98 percent of the respondents stated that supportive counseling should be offered when patients receive their test results. "We were surprised to see such a unanimous response," McCannel said. "We expected some patients would prefer not to know, but the numbers consistently said otherwise." "People understand that no good treatment currently exists after their cancer spreads. Everyone wants to know what their risk is for metastasis," said co-author Annette Stanton, a UCLA professor of psychology, psychiatry and biobehavioral sciences. "If the risk is low, it's a huge relief and emotional burden off patients' shoulders. If the risk is high, it enables patients to plan arrangements for their family and finances and make the most of their time alive." The UCLA survey also measured quality of life and depression symptoms in patients who received genetic test results and compared their rankings to those of untested patients. "Regardless of their test result, all of the patients rated themselves about the same in terms of quality of life and emotional well-being," Stanton said. "We hope that these findings reduce clinical resistance and pave the way for prognostic testing to become the standard of care in the management of ocular melanoma." "The issue of genetic testing has been a huge source of clinical controversy," McCannel said. "People want information; they have a lot of things they still want to do in life. Knowing their prognosis offers a tool that helps them plan their lives. Our research demonstrates that it's valuable to give people these details, even when their disease is not presently treatable." "Our results emphasize how important it is for patients to be treated in a full-service hospital research center that offers genetic testing and counseling and treats the whole patient, not just their disease," said Stanton, who is also a member of UCLA's Jonsson Cancer Center. Tumor biopsy also helps researchers search for key genes that play a role in aggressive metastasis, improving clinicians' ability to provide the best care. "After analyzing the tumor specimens, we grow the biopsied cells in a culture dish and can add drugs to test which ones block cancer growth," McCannel said. "That is how we're going to beat this cancer. Developing drugs to target these genes will one day result in therapies and a cure." 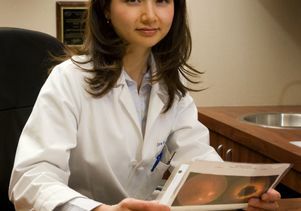 The technique of fine-needle aspiration biopsy for collecting cancer cells from the living eye has been utilized at the Jules Stein Eye Institute since 2004 but has been adopted by only a handful of other ophthalmic centers in the nation. Although rare, ocular melanoma is the most common eye cancer to strike adults. The National Eye Institute reports some 2,000 newly diagnosed cases of the cancer — roughly seven in 1 million people — per year. The disease spans the age and ethnic spectrum and is not hereditary. The study's UCLA co-authors included first author Tammy Beran, Dr. Bradley Straatsma and Barry Burgess. The research was supported by funding from UCLA's Jonsson Comprehensive Cancer Center.